Four weeks ago we looked at righteousness from the perspective of the Word being near. The Word of course is the Word of God, which we see sometimes as scripture and we also know as Jesus himself. Jesus is the living Word and his message becomes the living word. Through him we come to know the word, which is near and knowing the word brings us near to the Word. The old covenant readies us to know how significant God’s word is and can be, it leads us to be ready for God. Three weeks ago our readings pushed us to recognize we are citizens in heaven. Like citizens anywhere, to be a citizen of heaven comes with certain rights and responsibilities. We have the right to be treated equally, with freedom and trustworthiness. Also, we are responsible for living up to our citizenship by representing heaven well, encouraging others to immigrate (become citizens of heaven) and to be united with every other citizen of heaven. As we claim our citizenship in heaven, how we live will ready us more and more to receive God’s grace of righteousness. Two weeks ago we were guided by the readings to repent or perish. To repent can mean to regret something but in the gospel the word is based very much on the idea of changing direction. Jesus came so we could become new in him. In Jesus we are called to live a new life, to turn from the life we have lived without Jesus and to live our life completely within Jesus. If we do this we will live eternally, if we don’t change we will perish. Last week we were guided by the readings to know that we are in Christ a new creation. It means we are “rebooted.” We accept a new spirit from heaven and we live as though our life will continue forever rather than end when our body fails us. The readings led us to know we are a new creation. We are shown the nation of Israel as it becomes new, Paul tells us what it means to be a new creation in Christ and a story about two sons who both needed to become new creations. To be a new creation in Christ leads us to the Kingdom, and we become part of a process to make us holy, receiving righteousness from God. This week we the readings have us looking at straining forward. To be in Christ we must give up all that we were and had, and we must strain forward to what lies ahead, we must look at a new future with a new goal, that includes God’s calling, that we may be in Christ. It will require effort on our part, but the result will be the fulfilling of what God has begun in us by making us new creations. 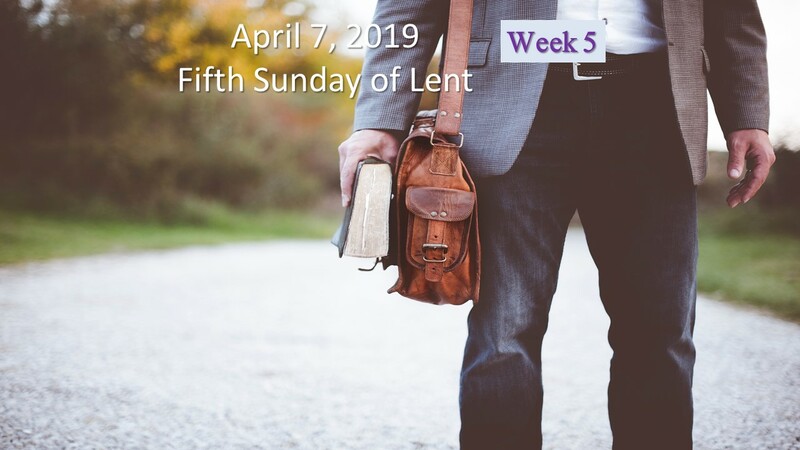 The readings this week are from the Lectionary for the Fifth Sunday of Lent; Isaiah 43:16-21; Psalms 126:1-2, 2-3, 4-5, 6; Philippians 3:8-14:17-21; John 8:1-11. The readings guide us toward straining forward, don’t look at what was but look toward what we will become. In the first reading from the Prophet Isaiah we read of a new exodus after the Israelites are being released as captives in Babylon. The people will again move through the desert back to their home. But God doesn’t want them thinking about what happened in the past where the people spent forty years in the desert searching for the Promised Land, this time God is doing something new. He promises never to abandon his people. Their path will be filled with water to drink, animals will not attack them, they will be safe and swift. They are people who have a good Lord, a holy King, the Holy One of Israel, Redeemer, Creator, who loves his people. He will not make them sacrifice as the others had, he will push them forward and they will have a new life. The prophet’s words are designed to fill them with hope that they will soon be home, and with energy to undertake the restoration of Israel. It is a reminder that God never abandons his own and is encouraging them with a new fervor. The people were in exile because of their infidelities, God allowed Babylon to capture and destroy their home. Now almost fifty years later they are free to return home. Yet God does not have the prophet mention their past failures, he wants them to strain forward, to have a new beginning. God is not a God who dwells on our past sins or failures, God is always hopeful about the future, he provides them with righteousness and new life. In the second reading from the letter to the Philippians, Paul is taking stock of his journey and realized that what he was to this point, a Pharisaic Jew, is nothing compared to what he has available to him straining forward. Paul did good work in the service of God as a Pharisee. Paul has always worked for God but now realizes the future is brighter being in Christ. Paul is happy to share in Christ suffering so he may also share in Christ resurrection. He admits he is not perfect but he is pursuing this new hope because he knows all that Christ Jesus is in him and he in Christ Jesus. By doing the work of Jesus and following him, Paul through faith has access to the righteousness from God; he is in right relationship with the Father, a divine gift, not something obtained through observance of the law. Through God’s gift of righteousness Paul knows he has life. For Paul everything is following Jesus and straining forward, each movement brings better and better knowledge of Jesus and right relationship with the Father. Paul encourages us all to strain forward and leave behind what we thought was important, seeing our hope in this new future Jesus has created. In the gospel reading from Luke we read the story of a woman caught committing adultery. To commit adultery for a woman is to take on capital punishment, the law declares she is to be stoned to death in front of everyone. This woman was brought to Jesus, as a test for him. Will he speak of love and forgiveness and overlook her sin or will he follow the law of Moses and have her killed ignoring his own teaching on mercy. Jesus tells those who are shouting for his response, let those who are without sin to be the first to throw a stone. No one wants to be first or claim to be sinless and so they drop their stones and walk off. In the end the woman and Jesus are left alone together with no stone thrown. Jesus tells her he does not condemn her either, and she should go and sin no more. This is a story of straining forward; forget about past sin, past infidelities, with Jesus, as we discussed last week, we are a new creation. So this woman now has a chance to strain forward as a new creation. She was forgiven by Jesus and encouraged. For her it has to be a resurrection moment, a time when someone sees her and not her sin. If Jesus who is without sin does not condemn her, how can she condemn herself? If Jesus sees a future for her, how can she not see a future for herself? New life is in front of her, all she has to do is accept it, straining forward. By accepting, she is also accepting the faith which gives access to righteousness from God. In this one encounter with Jesus, she is given life, eternally. Life in Jesus is a life looking ahead not back. We should live in the present moment but we should do so knowing that as we strain forward we see a journey of hope, a path to life, which allows us to forget about our sin, forget about being people who live for self-pleasure, becoming people who have Christ in us, Christ inhabiting us, or essentially living as people who are in Christ. Straining forward means to forget about the past, to think of ourselves as new creations, and to accept the hope that God has for us. These three readings all have a flavor of the idea of straining forward. God frees the Israelites from the captivity of Babylon and guides them back home to restore Israel. God doesn’t look back at their sin, God encourages them to look forward in hope. Paul sees his future as hopeful as he strains forward, accepting all the Jesus offers, suffering and resurrection, and thus Paul is gifted with the righteousness from God. He is in Christ, what he was is not of consequences as he becomes a new creation in Christ. Finally the story of a woman caught committing adultery has the woman enter a sinner and leave receiving righteousness from God. Each reading is an example of God pushing us forward to a new creation in Christ. We may stumble, and back step, it is the story of the entire bible, three steps forward two steps back, but for God righteousness is gifted straining forward not dwelling on the past. It is striking that Paul uses “strain forward” in his letter. It has particular meaning that I think truly helps capture Paul’s intent. There are other translations of the Greek word used which could be extend, stretch, press, all similar but I like “strain” as we have in the NABRE translation. Strain brings to mind several images. The first is to use force or a great strength or unusual effort, I strained my eyes to see a bird flying high in the sky. This image suits Paul’s application, to strain forward would take effort to see the goal and remain focused on the goal of new life. A second image of strain is to press a type of liquid through a “strainer” (a porous device) to separate solid from liquid, or separate waste from good. This image also helps us understand that when we are going forward in a new direction there are things we need to leave behind. Paul says as much in his letter. A third image of strain can looking at pushing or pulling something as in I strained a muscle doing some exercise. Here again, we are being pushed or pulled in a new direction, and it takes effort and maybe breaking down of old habits to help form new habits. Finally strain could be a severe or excess demand of strength, resource or abilities, as in we strained to lift the fallen tree off the fence. Also appropriate for Paul’s message as when we strain forward, new life could take excessive strength to accomplish. In order to strain forward we may have to use great force, severe strength, receive an excessive push and we should expect to leave some things behind. This is the message the theme from this week’s readings would have us consider. Last week we spoke about being a new creation in Christ, as we accept the Spirit within ourselves we are made new. As new creations we need to begin to strain forward, in other words we must put in some effort to take our new creation in the direction toward righteousness from God. Straining forward we need to work to fully commit to our newness in Christ. We are new in Christ, we receive this newness as gift, the Spirit indwelling in us. But, we are not done. To be righteous we must strain toward the goal of completely doing the will of God. We can’t work to become worthy of God, but we can strain forward to be a disciple of God. When we move toward God, open to receiving God’s gift of righteousness, we require faith. Faith brings us to an understanding that we are made new in Christ. It helps us understand what effort we must apply to be transformed in Christ. This is our goal that we become Jesus Christ. It may take our entire life, it may require constantly straining forward, but the complete transformation can occur, and we will receive righteousness from God. What must we do to strain forward; first we want to have a great force, something that is very important to us and can drive us to strain forward. What motivates you to work hard for something? Maybe you reward yourself along the way, or maybe you keep a mental image of the end result. We all need a driving force that we can rely on to keep us motivated. If you want to be in Christ you will need a great force to help motivate you. Paul used being in Christ as the goal but maybe that is too difficult an image for us. Perhaps knowing a life in Christ is a life lived better, that you’ll find peace where others find strife, you’ll see the good in all, you’ll laugh more and be happy. Finding some force that will help you strain forward and keeping it as a driving image will be necessary to constantly strain forward. Second we need severe strength. All along the journey we will be tempted to take the easy way. To continue the work of straining forward we must have discipline. We must have the strength of mind to know what we want to do and do it. Be it pray more, do good works, lead a ministry, whatever effort we are making to change. However we see straining forward to become in Christ we must use strength to keep going. There will be road blocks and pitfalls, whenever we stumble we must have the strength to get up and continue, we need a picture of success to rely on in those moments to encourage us to continue straining forward. Third we must have an excessive push. No matter the force, no matter our strength, there will always be days or times when we just want to let go, take a rest, do something with less effort. In these moments we need a push. It is best if this push comes from an outside agency, a friend or companion who understands your desire to strain forward and will encourage you to keep it up. They will remind you of the progress you made. A term for this is accompaniment, someone who cares enough about your spiritual journey they are willing to invest in you and push you when you need it. They know how important it is for you to strain forward and they want your success as much as you. Fourth and finally, there will be things we need to leave behind. We all have habits that get formed not so much from us deciding to do them as we just sort of fall into them out of routine. Rather than waking and praying or exercising, we jump on a device and check our Social Media to see what has happened while we slept. Did we get any new “follows.” Straining forward requires we take an inventory of what we are doing and deciding what helps us and what hurts us. What doesn’t help, needs to be left behind. Bad habits will only keep us from our goal, keeping good habits and leaving bad will better enable our chance of reaching our goal. We are called to strain forward as Paul did, as the woman who committed adultery was advised to do, as the Israelites did in rebuilding Israel. When we strain forward we can become fully in Christ, we can become Christ. Our life is better and we are better for those who are in our life. It leads to growing as new creations in Christ, a total transformation of someone from the world to someone of the Kingdom of God. The path to righteousness is a path that requires effort, we must strain forward. We are new in Christ when we choose to accept Jesus and do the will of the Father. To receive righteousness from God we must strain forward by leaving behind what is not good for us, we must keep our goal in mind, we must apply effort to get through, and we can use some help, someone to accompany us along the journey. Our transformation from being created “in the image of God” to being in Christ, to becoming Christ, requires we create the space that God will grace us with righteousness. Straining forward and ignoring the past helps us know we truly can be new. We are God’s beloved and in all our effort God wants us to succeed. God wants us open to receiving perfect righteousness. We must become a new creation in Christ, strain forward and turn away from what separates us from Jesus, do things that bring us closer to Jesus, letting the Jesus in us be revealed to all who meet us.